I wear winged eyeliner every single day. Yes, you heard that right. Unless it's a Sunday and my only plan is to run to Target maybe, I'm wearing winged eyeliner. It's a staple in my day to day look. I find that I look weird, tired and somewhat corpse-ish when I have no liner, let alone winged eyeliner on my upper lash line. I think this has been going on for a year or so religiously, though I've been slathering on liquid eyeliner without the wing since my freshmen year of college. Certainly this isn't a revolutionary idea, but it is a necessary step in my day to day makeup routine. Since I do wear liquid eyeliner every day, you can bet that I've tried my fair share. I started with Lorac's Front of the Line PRO Liquid Eyeliner and gradually moved onto the following: Stila Stay All Day Waterproof Liquid Eye Liner, Kat Von D Tattoo Liner, Maybelline Eye Studio Master Precise Ink Pen Eyeliner, Wet N Wild ProLine Felt Tip Eyeliner, L'Oreal Paris Infallible Super Slim Liner, Physicians Formula Eye Definer Felt-Tip Eye Marker, and most recently the Bobbi Brown Ink Eyeliner. I think that's all of them, granted in between all of those purchases was a repurchase of the Kat Von D Tattoo Liner. I'm very, very picky when it comes to eyeliner (and lipstick). When it comes to the rest of my makeup, I really don't notice much if something is off only a little bit. But the second I try a new liquid eyeliner, I can tell whether or not I will love or hate it. The only eyeliner I haven't had to try to talk myself into using more than a few times is the Kat Von D liquid eyeliner. It's the only one I have tried out of all of the ones above that actually wings my eyeliner out into a sharp, crisp line and doesn't start to fade or crumble off during the day. I just got the Bobbi Brown one and while it hasn't completely disappointed me yet, the Kat Von D one is cheaper, blacker and more precise. I'm going to finish off that Bobbi Brown one because I don't like to waste my money, but I can say with all certainty that I will not be finishing my L'Oreal or Physicans formula eyeliners (all recent purchases as well) because they just do not do the job. The L'Oreal one is a fine liquid eyeliner on its own, but if you want a crisp, defined wing...look elsewhere. And the Physicans Formula one is just too stiff and has an awkwardly shaped tip and I just am not sure how it's possible to get a precise line anywhere on the lid with it. The Maybelline eyeliner just didn't give me that super sharp edge to my winged eyeliner, but it was probably the best one from the drugstore that I tried out. It did dry out fairly fast on me though, which was a bummer. The Wet N Wild one also wasn't bad, but it was hard to get thin wings with it. But for thicker, more dramatic wings this one worked quite well! The tip is a bit hard though and towards the end when it was starting to dry out, it was a bit painful to apply. Unfortunately, I do not know how the Lorac or Stila eyeliners wing out as I owned them before I started wearing winged eyeliner, but I remember not loving the Stila eyeliner. Granted, I know that was because I just wasn't good at applying liquid eyeliner and while I'm tempted to try it out again, I'm really afraid of using any liquid eyeliner that isn't the Kat Von D one. Literally, every other eyeliner since starting to use that one has just been a massive, massive disappointment. So maybe this isn't even a battle of the liquid eyeliners. It's literally the Kat Von D Tattoo Liner completely destroying its competitors before the match even starts. 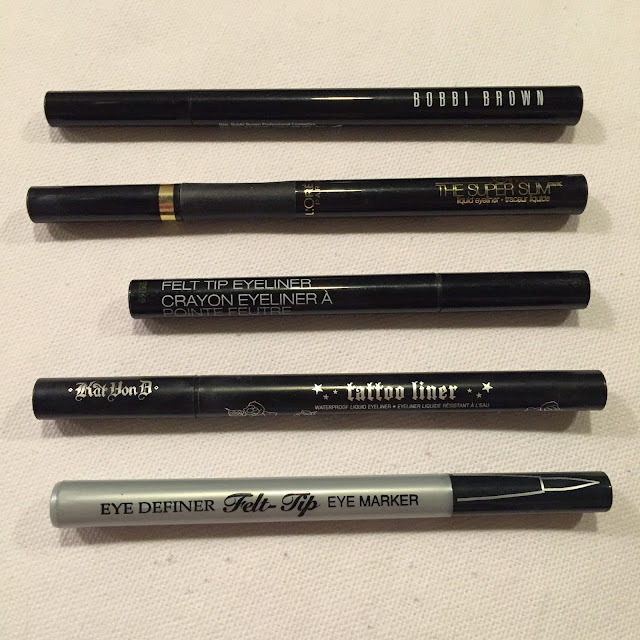 If you see the Bobbi Brown eyeliner in a Things I'm Loving post down the line, maybe it will get my stamp of approval, but I am 100% sure as soon as that one starts to dry out and run out of product, my little booty is going to hustle on over to Sephora to pick up my holy grail eyeliner, the Kat Von D Tattoo Liner. What's your favorite liquid eyeliner?